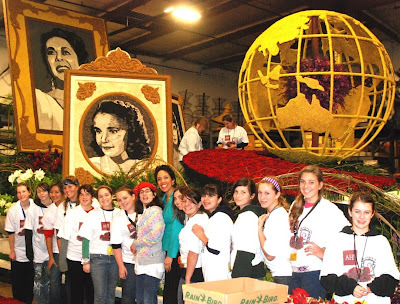 The Girl Scouts of San Gorgonio Blog reports that every year for the past 14 years the girls of Troop 593 have spent part of their winter break decorating floats for the Tournament of Roses Parade. This seasoned crew is in high demand by the float supervisors because of their meticulousness, work ethic and willingness to do whatever needs to be done. "The whole experience is really amazing," said 12th grade Ambassador Sarah Lloyd. "Being able to help with something that the whole country will see and knowing that you're trusted enough to be let onto the float to do cautious work--it's tremendous. The huge time commitment, the awkward hours of the night, the unhealthy snacks to keep you awake is all worth it. Anyone can be great because anyone can serve. Spending my winter break doing this makes me feel as if I'm a part of something special." This year the troop spent 5 days working with Fiesta Floats to help decorate and guard the AIDS Healthcare Foundation float, which won the Queen's Trophy for best display of roses. Many of the 16,000 roses donated for this float were personalized with the names of people who had died of HIV/AIDS. The girls were so moved by this, that they made sure every single one of those roses made it into the oversized AIDS awareness ribbon showcased on the front of the float. The troop was also able to spend some personal time with the new CEO for Girl Scouts of the USA, Anna Maria Chávez. "She actually took the time to speak to each girl individually, which was amazing and left the girls feeling quite star-struck." Said Troop co-leader Cindy Chapman. "She was extremely personable and down to earth. She talked with us about her desire to re-focus energy on our older girl population, something I feel very passionately about. I'm very excited about her plans and the future that's in store for Girl Scouts."